Lucerne is to have a new, ultra-modern, architecturally outstanding football stadium at the Allmend site – the swissporarena . It will replace the 75-year-old Allmend Stadium and provide modern facilities for professional football and popular sports. With a capacity increase to 18,000 spectator places and the highest standard of facilities, the swissporarena will host national top league matches as well as international games, and ensure the future of top-class football in Lucerne. 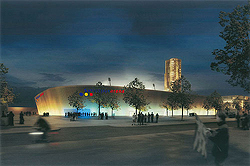 Construction began in September 2009 and the stadium is planned to open at the end of 2010. 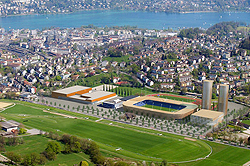 The new home ground of FC Luzern will be known as the swissporarena from now on – swisspor has acquired the rights to the name of the new stadium. It will be investing in the stadium’s top quality facilities and will continue its long-established co-sponsorship of FC Luzern. With this commitment swisspor is developing a long-term partnership for the future, which will bring benefits on both sides. The company is contributing to the facilities in Lucerne for modern popular sports, top league football and support and development for new young talent, and as an enterprise with its roots in central Switzerland and headquarters in the heart of the country, is investing in the future of its home region and its social and economic environment. In this way swisspor is giving recognition to its location, being true to its social responsibilities and in return is expanding the level of recognition of the group of companies and its brand. 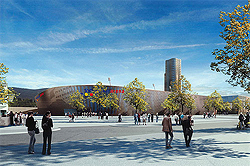 The swissporarena is one of three complexes of buildings to be built as part of an overall planning and development concept for the Allmend site, within the scope of a public-private partnership project involving the city authorities and private investors. In addition to the stadium there will also be two high-rise residential blocks, 88 and 77 metres high, with 330 two- to five- roomed units for both letting and owner-occupancy, and a sports centre with swimming pool, fitness suite, double gym, restaurant, retail and office space. The stadium and sports building will be augmented by a separate track and field athletics facility with 1950 covered seats, a shooting range, an indoor boccia court and tennis courts. The complex is set in parkland surroundings. 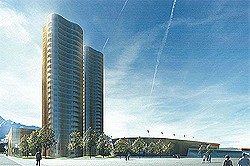 The swissporarena , sports centre and residential blocks are being built and will be operated by private investors. A conscious decision has been made not to develop the environs of the stadium site with a large-scale shopping centre, opting instead for a less intrusive additional use of high-rise residential development with tenanted flats and private use of the sports facilities to generate income. 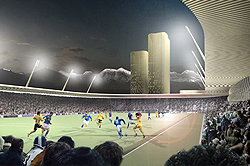 The swissporarena is planned to be constructed in concrete with steel roof girders; a special feature will be the gold-coloured reflective aluminium façade which will be illuminated in blue on FC Luzern home game nights. The complex consisting of the swissporarena , sports centre and high-rise blocks will be a distinctive architectural feature at the Allmend site. According to current plans, the swissporarena will provide 14,000 seated places and 4,000 standing places, giving capacity for a total of 18,000 spectators. 650 places will be designated business seats. There will also be 14 boxes and 80 places for the President’s Club. With the highest standard of facilities, the swissporarena will host national matches in the Axpo Super League as well as international UEFA games.